Mama may have cooked a lot of “Chicken and Dumplings” in her time, but I don’t have any real memories of her making “Backbone and Dumplings.” I’m sure she did, just not as often as the chicken version. Perhaps she just preferred chicken over the pork, as we raised chickens most of the time and only raised pigs part of the time during my youth. 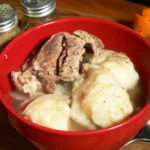 Still, backbone was considered one of the cheaper cuts of meat, and adding the dumplings made it a great way to extend the meat into a full meal. 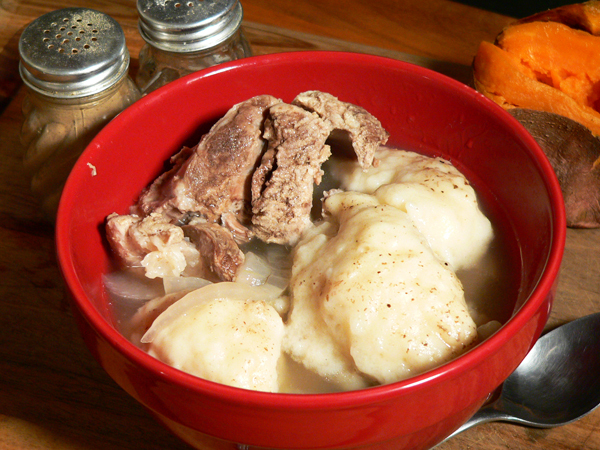 It doesn’t take much meat and just a couple of dumplings to fill one up at suppertime. It’s a perfect meal for a hard, cold, winter evening after a long day of work. This is the second of my “backbone” recipes posted here on Taste of Southern. The first one, “Backbones and Rice,” came about after a conversation with my older brother on one of our road trips. As we often do, we started talking about the “old days” and “hog killing time.” I think it was because the weather had just turned pretty cold here and somehow the expression of “it’s cold enough to kill hogs,” came up. That just got the conversation rolling to talk about food. Older brother was recalling how good it was to get that first taste of fresh pork once the hog killing process had moved forward enough to actually start cooking some of the pork. Hog killings were always held once the cold weather moved in, usually around Thanksgiving or so. After starting work early in the morning, the process would get to the point of actually cutting up some pork by noon time. Tenderloin was usually the first thing cooked from a freshly processed hog. We talked about Mama making a big pan of her buttermilk biscuits, and frying up some Tenderloin. Each hot biscuit would have a big hunk of Tenderloin in it, as Mama passed them out to everyone working that day. They don’t call it “tender” for nothing. Older brother says fresh pork like that is a taste you just can’t get from meat purchased in a store. Next, he mentioned the backbone. Tenderloin is pulled from right beside the backbone it seems. I hadn’t really heard much about pork backbone, so I started asking questions of him. He not only participated in a good number of hog killings, but he also owned his own supermarkets for most of his working time before retirement. Backbone is sometimes referred to as “Country Style Ribs,” so that may be what you’ll need to look for in your local grocery store. It usually contains a small amount of bone, but larger pieces of meat, and is most often grilled, or baked with barbecue sauce in the oven. As things would go, I ended up at a big store that carried nothing but pork products a week or two later. That’s when I saw a big package of pork “backbone” and decided to bring it home. I wasn’t sure what I’d do with it at the time, but after searching some favorite cookbooks, I came across recipes for the rice dish and this dumpling dish. I also found mention of a “Backbone and Macaroni” dish, but didn’t have enough meat from that one package to make all three. The package weighed right at 6lbs, so I divided that into two separate recipes. I do hope you’ll also check my recipe for Backbone and Rice out while you’re visiting today. Both are equally good in my opinion. Dumplings may be a bit of an acquired taste. Some folks may just consider them to be big hunks of dough, but they sure do bring back lots of memories for me each time I bite into one. While there IS a cornmeal dumpling, these are made with All-purpose Flour, salt, baking powder, and milk. They are called “drop dumplings” because they are dough, dropped from a spoon, as opposed to rolling dough out flat like Mama did for her Chicken Pastry recipe. I need to also mention that you could easily substitute canned biscuits for the dumpling part of this recipe. I’ll share that with you further down in the instructions and photos below. So, if you’re ready to give our Pork Back Bone and Dumplings recipe a try, grab your apron, head to the kitchen… and Let’s Get Cooking. 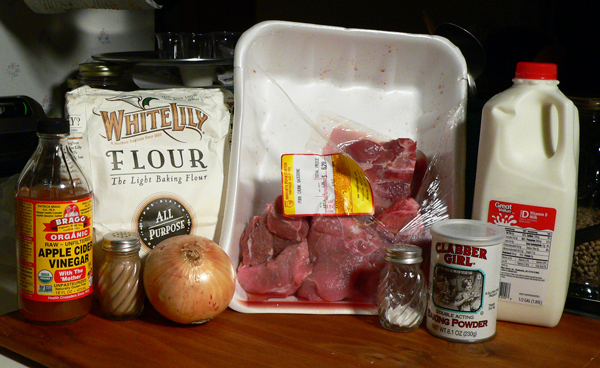 Pork Back bone and Dumplings Recipe, you’ll need these ingredients. I’m using the remaining portion of a package of backbone that I purchased. The first half was used to make Backbone with Rice. 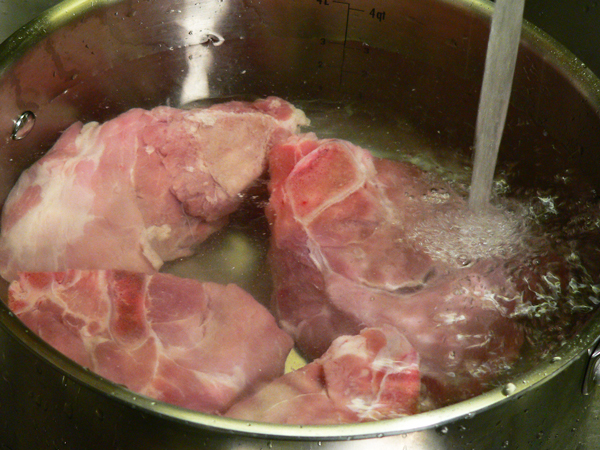 Rinse the backbone meat under cold running water. These were large pieces of backbone as you can see from the photo. You could cut it into smaller pieces if desired before cooking, but I’m going to pull the meat from the bones later in the process, so I’m cooking them as is. 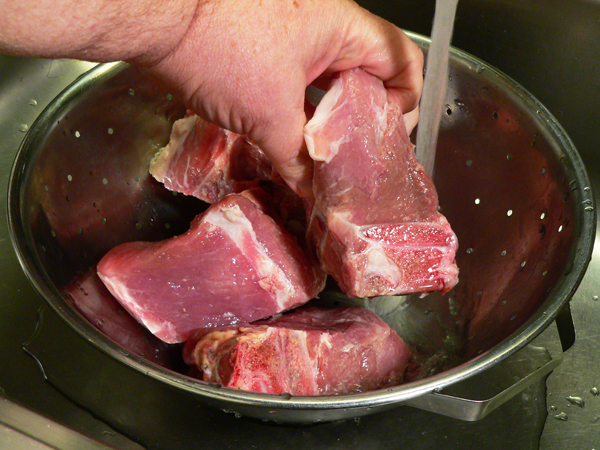 Place the meat in a large sauce pot and cover it with water. Slice or dice the onion, and add it to the pot. ADD THE APPLE CIDER VINEGAR: I failed to take a photo of adding the vinegar, but you’ll need to go ahead and add it to the pot as well. 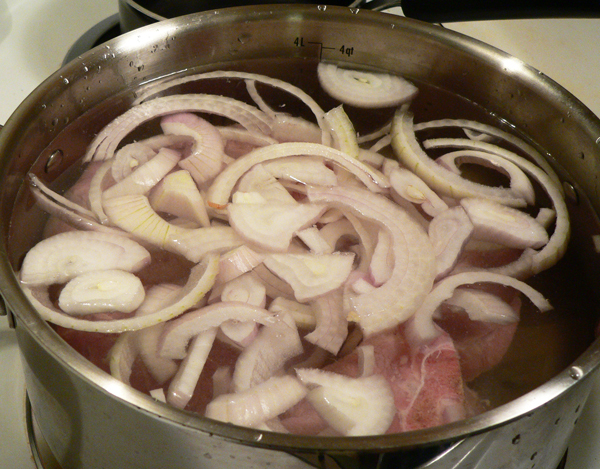 Bring the meat up to a slight boil, then reduce the heat to a low simmer. Let the meat simmer for about 1 hour to 1 1/2 hours, or until the meat is good and tender. 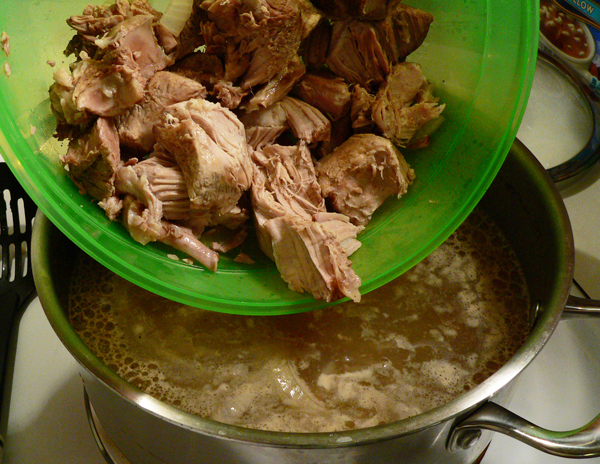 When the meat is tender, remove it from the broth and set aside until it cools enough to handle. 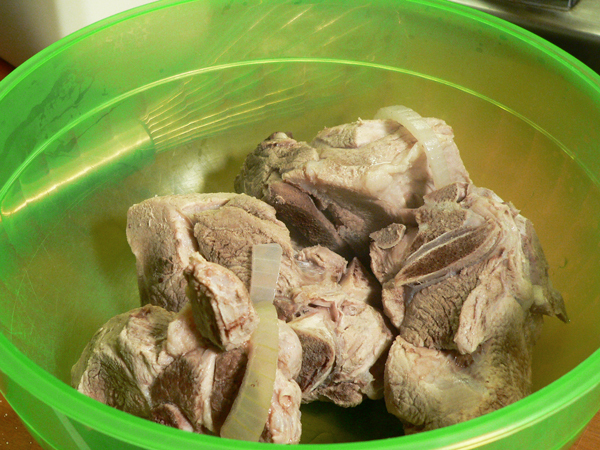 You’ll want to remove the bones from the meat and discard them. The meat should be easy to pull once the meat is cooked. When the meat is tender, begin making the dumplings. 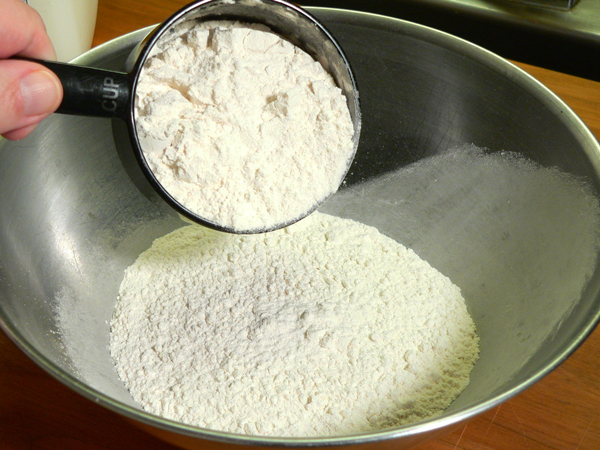 In a medium sized mixing bowl, add the Flour. 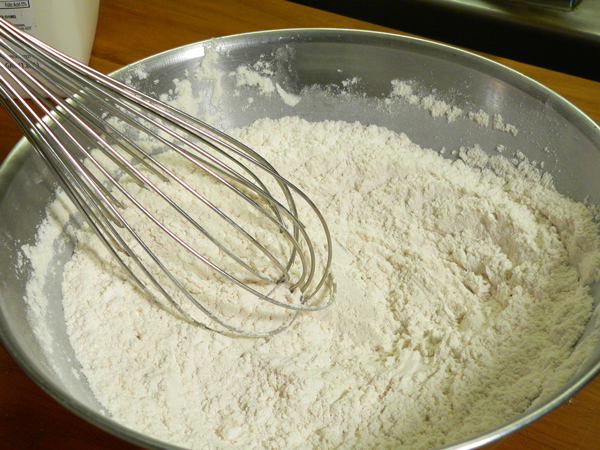 Whisking will not only mix the ingredients, but it will also add air to the flour. We do this since we didn’t sift the flour in the beginning. Gradually add milk as needed to make a moist dough. 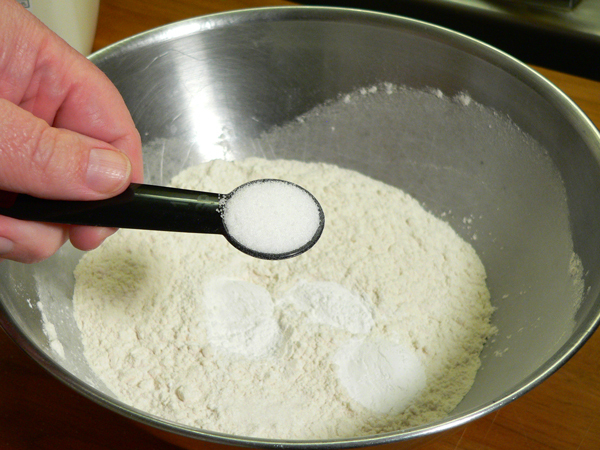 Mix the milk and dry ingredients together with a large spoon. 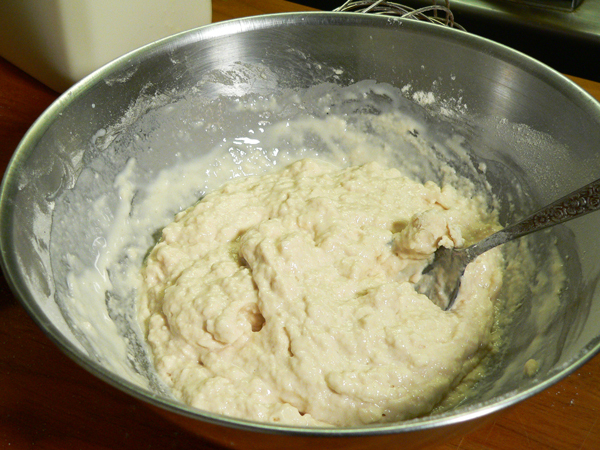 The mixture needs to be a moist dough. Add the milk gradually and mix everything together well. 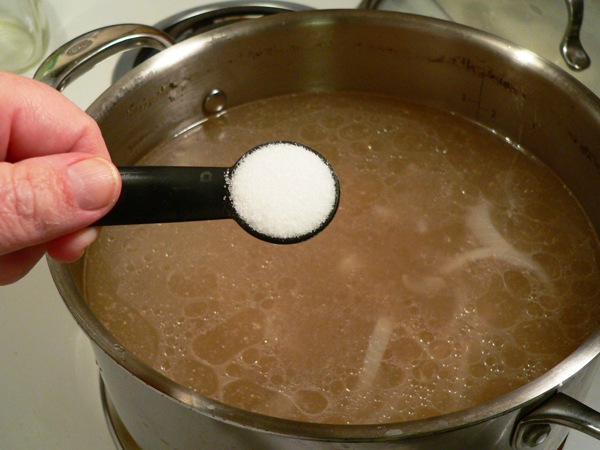 Add Salt to the broth. Add the meat back to the pot. Give it a good stir to mix in the salt and pepper. 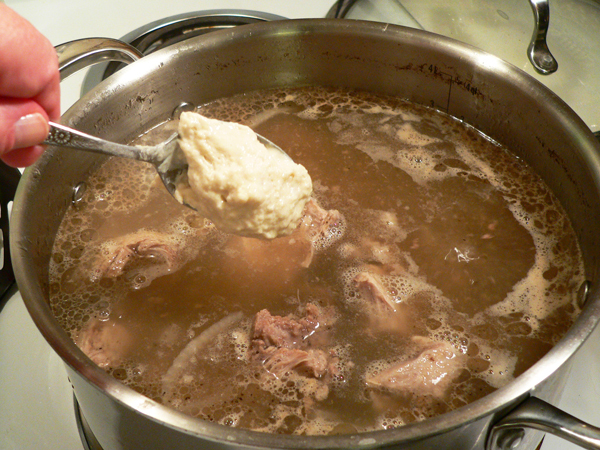 Using a teaspoon, scoop up a small amount of the dough and drop it into the broth in the sauce pot. You really don’t want to use a lot of the dough as the dumplings are going to swell up in the broth as they cook. Make them small so they will cook easier. Alternate the spots where you drop the dough so they have a little time to cook as you go. This will help keep them from sticking together as they cook. I think I made about 16 dumplings from the dough. Do not stir the pot once you have dropped the dumplings in. Cover the pot once again. 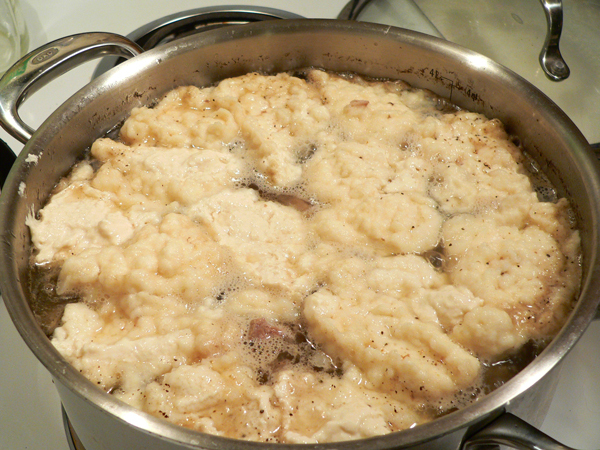 Placing a lid back on the pot will help the dumplings to cook up light and tender. Again, you do not want to stir the pot. 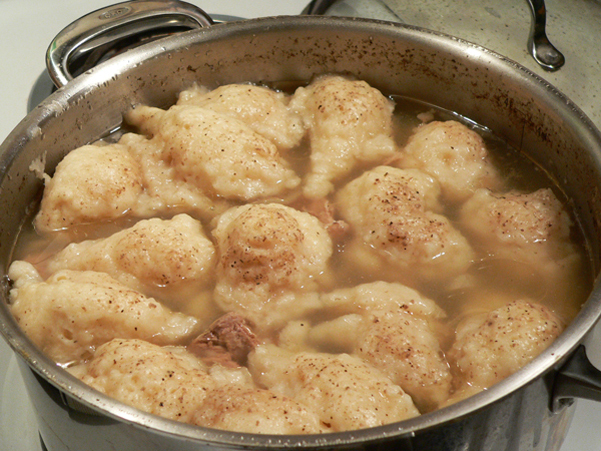 Let the dumplings cook in the broth for about 15 to 20 minutes, then they will be ready to serve. As you can see, the dumplings have puffed up quite a bit. Also notice that they aren’t sticking together but separate. I’d also like to mention that you could use canned biscuits to make the dumplings instead of mixing them on your own. The scratch made type may be a bit thick and heavier than some folks might prefer. In her later years, Mama started making Chicken Pastry with canned biscuits as opposed to rolling out dough and making them from scratch. They were pretty tasty and puffed up light and fluffy. Use the cheapest canned variety of biscuits you can find if you decide to do them this way. Pinch each biscuit into about three smaller pieces, then drop them into the broth, just like we did the scratch made dumplings above. The results will still be good, but I do encourage you to make them from scratch at least once. Each bowl should get a serving of meat and several of the dumplings. Sweet potatoes go well with the Backbone and Dumplings. Enjoy! Rinse the backbone pieces under cold running water. Place a large saucepot on Medium heat on your stove top. Slice the onion thinly, and add to saucepot. Bring mixture to a slight boil. Cover pot. Reduce heat to Medium-Low. 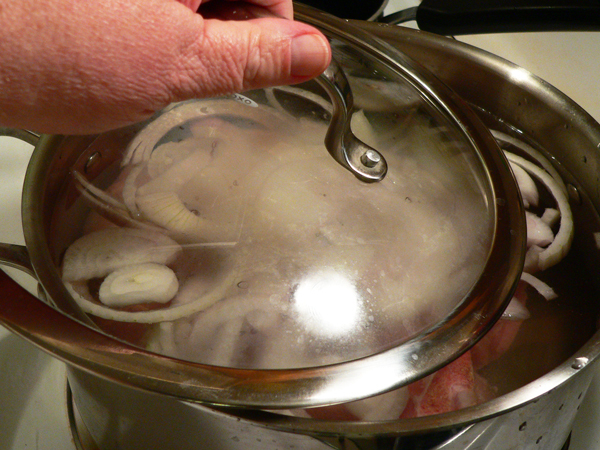 Simmer backbone for 1 to 1 ½ hours, or until meat is tender. Remove backbone from broth and let cool. Remove bones from the meat. Discard the bones. 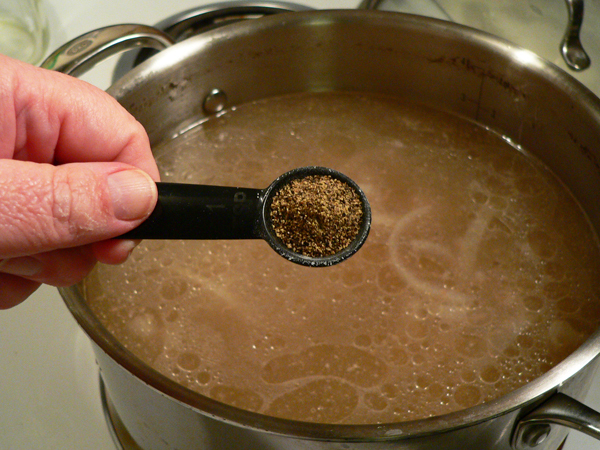 Add black pepper to broth. 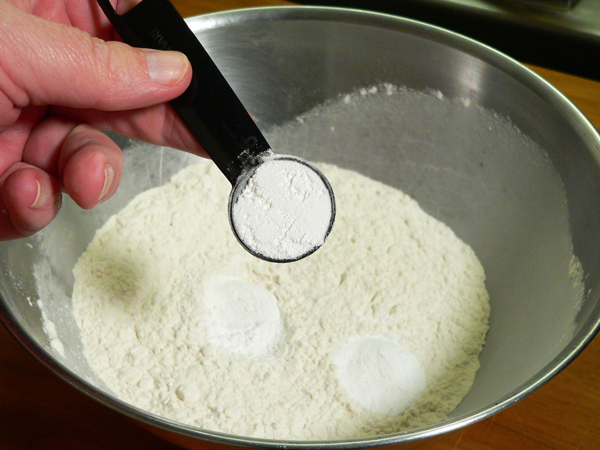 Place flour in a small mixing bowl. Whisk dry ingredients together well. 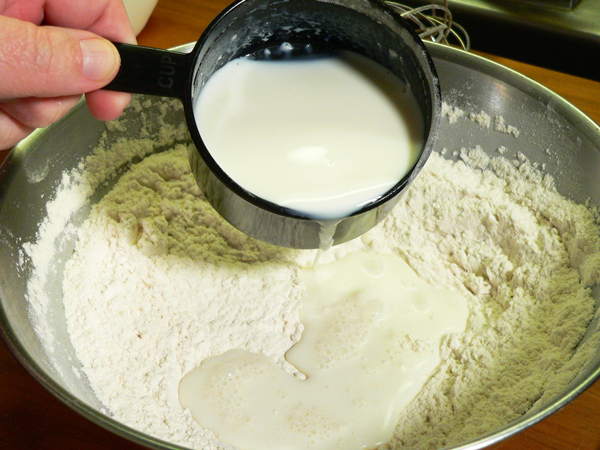 Gradually add milk, as needed, to dry mixture to make a dough. Bring the backbone back up to a slight boil. 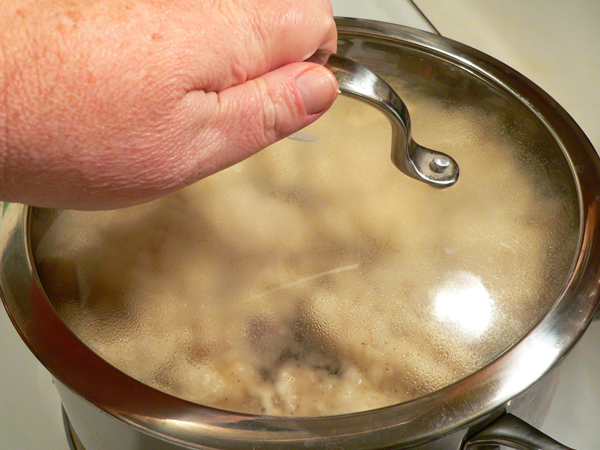 Drop the dough by small spoonfuls, into the boiling water. Cover pot. Let boil about 15 minutes. Do not remove lid or stir until ready to serve. Regular canned biscuits can be used to make the dumplings if desired. Just pinch each biscuit into about three pieces and drop into the hot broth. Cover the pot and let cook 10-15 minutes without stirring. Your Comments: Ever tried Pork Backbone and Dumplings? I’d love to hear your comments on our recipe. It will only take a minute or two for you to share your comments in the section below. Just remember, all comments are moderated. That just means that I personally read each and everyone before they are approved for viewing on our family friendly website. Thank you in advance for sharing. Hi Steve,I enjoy you’re recipes and newsletters.I will take a guess and say you are going to cook chitlings for the next pork recipe.I will look forward to the recipe,as I have never seen any cooked. Pork backbone and pork shoulder are such tasty and economical cuts of meat–it really helps with the budget. I used to love making (and eating)my homemade dumplings, but I have to watch my carb intake since being told I was prediabetic. The pork with onions and a side of mushrooms and buttered green beans was still a great meal–thanks, Steve; all the best! I never knew the term “backbone” but have eaten my weight in Country Style Ribs. My mother always barbequed them and they are tender and moist. Thank you Steve for “learning” me something new.